You are currently browsing the archives for the day Monday, February 20th, 2017. Jimmy Choo‘s printed ‘Candy‘ clutch bags demonstrate the brand’s playful approach to cult classics. The interior is perfectly proportioned to house just your essentials. Conceal the silver chain strap inside to carry it as a clutch. The slogan will be statement enough! Bags in collage: Candy Box Clutch «I Want Choo» in pink, Candy Box Clutch «Choos Me» in blue and Candy Box Clutch «Only Choo» in lilac. 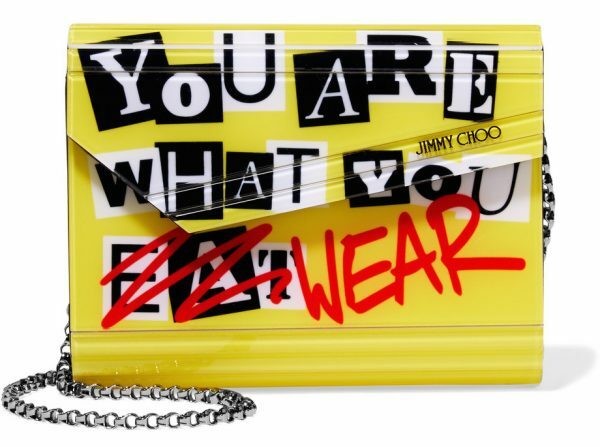 My favorite is this one: Candy Box Clutch «You Are What You Wear» in yellow.